The Eltron TLP 2824 has been renamed to the Zebra TLP 2824. The easiest printers to load on the planet! Thermal transfer printing, 203 dpi, 2.25" print width, Serial and Ethernet Interfaces, Cutter. Includes US power supply. Order cables separately. 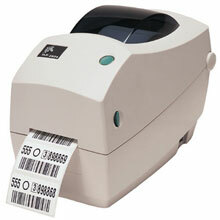 Thermal transfer printing, 203 dpi, 2.25" print width, Serial and Ethernet Interfaces, Dispenser. Includes US power supply. Order cables separately. Thermal transfer printing, 203 dpi, 2.25" print width, Serial and Ethernet Interfaces. Includes US power supply. Order cables separately. Thermal transfer printing, 203 dpi, 2.25" print width, Parallel Interface, Cutter. Includes US power supply. Order cables separately. Thermal transfer printing, 203 dpi, 2.25" print width, Parallel Interface, Dispenser. Includes US power supply. Order cables separately. Thermal transfer printing, 203 dpi, 2.25" print width, Parallel Interface. Includes US power supply. Order cables separately. Thermal transfer printing, 203 dpi, 2.25" print width, Serial and USB Interfaces, Cutter. Includes US power supply. Order cables separately. Thermal transfer printing, 203 dpi, 2.25" print width, Serial and USB Interfaces, Dispenser, Real-time clock, Expanded Memory. Includes US power supply. Order cables separately. Thermal transfer printing, 203 dpi, 2.25" print width, Serial and USB Interfaces, Dispenser. Includes US power supply. Order cables separately. Thermal transfer printing, 203 dpi, 2.25" print width, Serial and USB Interfaces, Real-time clock, Expanded Memory. Includes US power supply. Order cables separately. Thermal transfer printing, 203 dpi, 2.25" print width, Serial and USB Interfaces, Real-time clock. Includes US power supply. Order cables separately. Thermal transfer printing, 203 dpi, 2.25" print width, Serial and USB Interfaces, Expanded Memory. Includes US power supply. Order cables separately. Thermal transfer printing, 203 dpi, 2.25" print width, Serial and USB Interfaces. Includes US power supply. Order cables separately. This is the second printer that I have purchased for our company. I have had no complaints or problems with either one. I havge had the first for over a year now. Great printer for the money and size. It works better than the four other label printers that I have availiable, the barcodes that I print don't fall off, but they peel off when needed. It can print several hundred labels at a time with no problems. I like this one.